The role of peri-islet CD45-positive leucocytes, as one component of insulitis, in beta cell death during human type 1 diabetes remains unclear. We undertook a case study, comparing and quantifying leucocytes in the peri- and intra-islet areas in insulin-positive and -negative islets, to assess whether peri-islet leucocytes are pathogenic to beta cells during type 1 diabetes. Pancreatic sections from 12 diabetic patients (0.25–12 years of disease) and 13 non-diabetic individuals with and without autoantibodies were triple-immunostained for islet leucocytes, insulin and glucagon cells. Islets were graded for insulitis, enumerated and mapped for the spatial distribution of leucocytes in peri- and intra-islet areas in relation to insulin- and glucagon-immunopositive cells. In the non-diabetic autoantibody-negative group, the percentage of islets with insulitis was either absent or <1% in five out of eight cases and ranged from 1.3% to 19.4% in three cases. In the five non-diabetic autoantibody-positive cases, it varied from 1.5% to 16.9%. 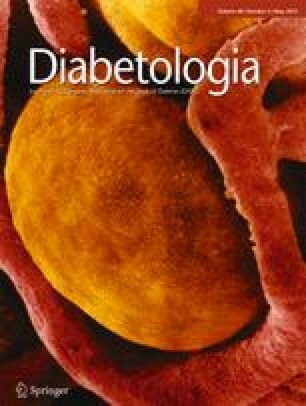 In the diabetic group, it was <1% in one case and 1.1–26.9% in 11 cases, with insulitis being absent in 68% of insulin-positive islets. Peri-islet leucocytes were more numerous than intra-islet leucocytes in islets with insulin positivity. Increasing numbers of exocrine leucocytes in non-diabetic autoantibody-positive and diabetic donors were also present. The prominence of peri-islet leucocytes in insulin-positive islets in most long-standing diabetic individuals suggests that they may be pathogenic to residual beta cells. Increasing numbers of leucocytes in the exocrine region may also participate in the pathogenesis of type 1 diabetes. An erratum to this article can be found at http://dx.doi.org/10.1007/s00125-015-3631-7. Type 1 diabetes results from immune-mediated destruction of beta cells over a prolonged asymptomatic period lasting several months to years [1, 2]. Several events within the islet appear to initiate distinct deleterious pathways culminating in beta cell loss, such as the engagement of activated CD8 T cells with beta cells that overexpress MHC class I molecules through a tri-molecular complex and interaction of Fas with Fas ligand [3, 4, 5, 6]. Proinflammatory cytokines and reactive oxygen and nitrogen species produced by islet-infiltrating immune cells such as macrophages and T cells, or by beta cells themselves, may also be significant contributors to beta cell destruction [7, 8, 9]. Despite advances in our understanding of islet pathology in human type 1 diabetes, the processes that lead to sustained and protracted invasion of the islets by immune cells in vivo and how such infiltrates inflict beta cell damage remain enigmatic. This void is largely attributable to the lack of reliable non-invasive techniques that can prospectively follow the dynamic immunopathological changes within the islets of living individuals. Direct translation of islet immunopathology from animal models, such as the NOD mouse, an in-bred strain, to humans, has significant limitations . For example, the pattern and severity of islet infiltrates (insulitis) may be less marked in humans, who also harbour a different array and proportion of immune cell sub-phenotypes within the insulitic lesion compared with NOD mice [11, 12, 13, 14, 15, 16, 17, 18, 19, 20]. Insulitis in humans has been reported to be often patchy and less invasive than in NOD mice at and after clinical presentation, the significance of which remains unclear [11, 18, 19]. Cross-sectional analyses of cadaveric pancreatic tissues, despite certain limitations, offer a powerful alternative approach for deciphering islet pathology and unravelling the complex immunopathogenic mechanisms in human type 1 diabetes. Examination of archival human pancreatic samples shows significant variability in the presence and spread of insulitis within and between individuals [15, 16, 17, 18, 19, 20]. This variable pathology is less obvious in NOD mice [10, 14]. Over the last 100 years, insulitis has been studied in only approximately 150 human type 1 diabetic subjects and has shown both peri- and/or intra-islet distributions [15, 17, 19, 20]. However, this spatial distribution may be dynamic depending on the rate of disease progression and its duration following diagnosis and on the presence of beta cells . The extent of leucocytic distribution within these two distinct islet zones has not been fully characterised, leaving several critical questions unanswered. How does insulitis begin, how is it sustained and how does it ultimately resolve? What is the pathogenic role of leucocytic infiltrates within and around the islets in mediating beta cell destruction during human type 1 diabetes? Is insulitis also present in non-diabetic individuals? In type 1 diabetes, whether a close apposition of T cells to target beta cells is mandatory for beta cell destruction remains equivocal. In humans, limited studies show the presence of residual beta cells in some islets many years after onset, accompanied by a variable number of islet leucocytes [21, 22]. Exposure of human islets in culture to a mixture of IL-1β, IFN-γ and TNF-α results in beta cell dysfunction and ultimately death [23, 24]. Furthermore, exposure of islets to IL-1β and IFN-γ results in the upregulation of key markers of endoplasmic reticulum (ER) stress in beta cells . By immunohistochemistry, markers of ER stress are localised in human beta cells with coexisting peri-insulitis . In the NOD mouse, peri-islet insulitis may also invoke beta cell ER stress preceding diabetes onset . It is therefore plausible that peri-islet leucocytes may release soluble mediators resulting in beta cell damage through non-contact-dependent mechanisms, in addition to the deleterious effects of intra-islet leucocytes, such as cytotoxic T cells. Thus, a more precise knowledge of islet leucocyte pathology is likely to shed important insights on their role in mediating beta cell death. In order to further characterise the topography of leucocytic insulitis, we report our initial findings employing novel triple-label immunohistochemical techniques to systematically assess the extent and spatial distribution of peri- and intra-islet leucocytes in relation to residual beta cells and glucagon cells in cadaveric pancreatic sections supplied by the recently established Network for Pancreatic Organ Donors with Diabetes (nPOD) programme . Paraffin-embedded sections of pancreas fixed in formalin were supplied by nPOD. Approval for conducting the study was granted by the New Zealand Ministry of Health and Disability Ethics Committee (approval number NTX//11/EXP/092/AM01). We studied sections from 25 nPOD cases, summarised in Tables 1 and 2. Sections (5 μm) were de-paraffinised, rehydrated and subjected to antigen retrieval with citrate buffer containing 0.05% Tween-20 (Sigma-Aldrich, St Louis, MO, USA). During immunohistochemistry, PBS, pH 7.4, was employed as a wash step. Sections were equilibrated in PBS and blocked with 5% normal goat serum (Sigma-Aldrich) for 1 h at 37°C. A mixture of guinea pig anti-insulin serum (A0564, dilution 1:600; Dako, Glostrup, Denmark) and rabbit anti-glucagon serum (A0565, dilution 1:200; Dako) in 5% normal goat serum (Sigma-Aldrich) was applied and incubated for 1 h at 37°C. Highly cross-adsorbed species-specific goat anti-guinea pig IgG-Alexa 568 (A11075; Invitrogen, Eugene, OR, USA) and goat anti-rabbit IgG-Alexa 488 (A11034, dilution 1:600 in 5% normal goat serum; Invitrogen) were then applied as a mixture and incubated as in the previous step. Sections were incubated with mouse anti-human CD45 (M0701; Dako; clones 2B11 + PD7/26, dilution 1:100 in PBS + 0.1% Tween-20) for 16 h at 4°C, washed and reacted with 3% H2O2 for 15 min. After washing, sections were incubated sequentially with donkey anti-mouse IgG-biotin (715-065-150; Jackson ImmunoResearch, West Grove, PA, USA, dilution 1:200 in PBS + 0.1% Tween-20) and streptavidin-horseradish peroxidase (016-030-084; Jackson ImmunoResearch, dilution 1:200 in PBS/0.1% Tween-20). They were finally exposed to a diaminobenzidine chromogenic mixture (Sigma-Aldrich) to visualise CD45 cells. Non-immune serum or IgG from the immunising species and omission of primary antibodies acted as negative controls. Sections were examined with a Nikon Eclipse E600 microscope under epifluorescence and bright field microscopy and digital images were recorded. All islets in a section with ≥20 endocrine cells were imaged for the presence of insulin, glucagon and CD45 cells and each of the three image sets from multiple acquisitions merged with Adobe Photoshop CS4 following conversion of CD45-positive cells to a greyscale fluorescence mode. Peri- and intra-islet CD45 cells were enumerated manually in all sections. For the diabetic group, observers were blinded to the case details, including autoantibody status. Islets with approximately ≥20 endocrine cells were analysed. Single glucagon and insulin cells scattered within the exocrine region were not enumerated, while sections from diabetic cases containing small islets (20 cells) but harbouring at least one insulin cell were recorded. The total numbers of insulin-positive and -negative islets in the pancreatic head, body and tail were also recorded in each section. Insulitis was defined by a recent guideline which stipulates that the total number of leucocytes in close contact with the islet boundary (peri-insulitis) and within the intra-islet areas is equal to or greater than 15 . Peri-islet leucocytes not in immediate contact with the islet boundary but located in the outer zones of the peri-insulitic ‘cap’ observed in some diabetic islets, although recorded, were not included in the analyses. The percentages of islets positive for insulitis and beta cells in the pancreatic head, body and tail from each case and as a sum of all three regions were represented as bar graphs. The mean ± SD number of intra-islet and peri-islet CD45 cells per case was calculated separately. For each case, the number of leucocytes per islet and the number in intra- and peri-islet areas were represented as box plots showing the interquartile range and the median (horizontal line), the whiskers represent the maximum/minimum observation within 1.5× interquartile range and the circles, the outliers (i.e. points outside 1.5× interquartile range). The mean numbers of peri- and intra-islet leucocytes in insulin-positive islets were also calculated for each case. From this, a 95% CI for the mean difference in peri- and intra-islet leucocytes for non-diabetic autoantibody-negative cases compared with diabetic cases with insulin-positive islets was calculated using Student’s t test and the Welch–Satterthwaite equation that assumes non-equal variance. Selected images showing the distribution of insulin, glucagon and CD45 cells in islets and surrounding exocrine regions of non-diabetic and diabetic cases are shown in Figs 1, 2, 3, and 4. In non-diabetic cases, irrespective of autoantibody positivity, all islets showed a normal complement of insulin and glucagon cells (Fig. 1a–h). In non-diabetic autoantibody-negative cases, a majority of islets harboured only a few leucocytes within and around the islets and in the exocrine regions (Fig. 1a, b). In cases with one or two autoantibodies, there was a modest non-uniform qualitative increase in leucocytes in exocrine areas (Fig. 1c–h). In case 6158 (non-diabetic with two autoantibodies), occasional exocrine leucocytic clusters were present close to the islet and scattered within the islet (Fig. 1e, f). In diabetic cases, the distribution of the three cell types within the islets was variable. In case 6209 (diabetes 0.25 year), beta cell numbers showed considerable inter-islet variability, with several beta cell-negative islets. Islets with pronounced beta cells had leucocytic infiltrates (Fig. 2a, c). An islet with a reduced number of beta cells is shown in Fig. 2b. There were occasional clusters of leucocytes in close contact with insulin-negative islets (Fig. 2d), and, when leucocyte numbers increased, the increase was mostly in peri-islet and exocrine locations, and not in the intra-islet areas. Peri-insulitic islets were often ‘capped’ by multilayers or clusters of leucocytes or singly (Fig. 2a–c). Intra-islet leucocytes adjacent to beta cells were infrequent (Fig. 2a–c). In case 6052 (diabetes 1 year), there were more leucocytes in the peri-islet and exocrine areas than in the intra-islet areas (Fig. 3a–d). Intra-islet leucocytes in some islets were close to beta cells, while other islets with numerous beta cells harboured a small number of leucocytes (Fig. 3d). This was also observed in case 6113 (diabetes 1.58 years; Fig. 3e) and case 6224 (diabetes 1.5 years, without autoantibodies; Fig. 3f). In case 6087 (diabetes 4 years), islets were insulin-negative, with smaller numbers of leucocytes in the peri-islet, intra-islet and exocrine regions (Fig. 3g). In case 6243 (diabetes 5 years), a relatively higher proportion of islets were insulin-positive (serum C-peptide 0.14 nmol/l), with fewer islet-associated leucocytes (Fig. 3h). In case 6070 (diabetes 7 years), leucocytes were prominent as peri-islet clusters and in exocrine regions, with fewer intra-islet leucocytes, mostly adjacent to beta cells (Fig. 4a, b). In case 6046 (diabetes 8 years), insulitis was minimal in islets with several beta cells (Fig. 4c, d); while in case 6049 (diabetes 10 years), beta cell-positive islets were absent, although a few insulin and glucagon cells were scattered in the exocrine region amongst leucocytic infiltrates, consistent with pancreatitis of the donor (Fig. 4e, f). In case 6039 (diabetes 12 years), beta cells persisted in several islets with peri- and/or intra-islet leucocytes (Fig. 4g, h). The percentages of insulitic islets in the head, body and tail in diabetic cases, and overall in non-diabetic autoantibody-negative and -positive cases, are shown in Fig. 5a–c. In the non-diabetic autoantibody-negative group, while islets from five cases without autoantibodies were virtually insulitis-free (≤1.31% of islets), cases 6179, 6162 and 6134 showed overall values of 8%, 10.9% and 19.l%, respectively (Fig. 5a). All five non-diabetic cases with either a single or two autoantibodies had some level of insulitis (1.5–16.9%), with case 6167 having the highest value (26.9%) in the tail (Fig. 5b). In diabetic cases, insulitis levels varied overall and in the three pancreatic regions. Generally, they were lower in the two cases with disease of 1.5 years (autoantibody-negative) and 1.58 years (single autoantibody) than in the remaining cases (Fig. 5c). In the three cases with 8 years of disease, insulitis levels were lower than in cases with 5, 7, 10 and 12 years of diabetes. Overall, comparisons showed that the values were neither region-specific nor dependent on the number of autoantibodies or their antigen-specificity, except in case 6049 (two autoantibodies), which showed higher levels in the head. In case 6049, the overall insulitis score (27%) was also higher than in the remaining diabetic cases, accompanied by extensive exocrine infiltrates, consistent with moderate pancreatitis of the donor (the only diabetic donor with African-American ethnicity studied). The mean overall severity of insulitis was higher in diabetic (9.4%) than in non-diabetic autoantibody-negative (5%) and -positive (6.9%) cases. The percentage of insulin-positive islets in non-diabetic autoantibody-negative and -positive cases was almost 100% (Fig. 5d, e). In cases with 0.25–1.58 years of diabetes, the overall percentages ranged from 6% to 19%, but in case 6087 the percentage was 0% (4 years of diabetes; Fig. 5f), despite an overall insulitis level of 4.9% (Fig. 5c). In cases with 5–12 years of disease, three showed an absence of beta cells in their islets, while four cases harboured a high percentage of beta cell-positive islets (Fig. 5f). Case 6243 had the highest percentage of islets with surviving beta cells (43.56%), consistent with the higher serum C-peptide level at organ retrieval. Of note, cases 6070, 6046 and 6039 harboured beta cells in 25–36% of their islets; while in case 6049, the pancreatic head showed the highest percentage of insulitis (45%), but all islets were beta cell-negative (Fig. 5c, f). Leucocyte numbers in each islet of non-diabetic autoantibody-negative and -positive cases and diabetic cases, represented as box plots, indicate that islets from diabetic cases had a qualitatively higher leucocyte density compared with non-diabetic cases (Fig. 6a–c). In the diabetic group, the mean number of leucocytes in insulin-positive islets was higher in peri-islet areas than in intra-islet areas for each case (Fig. 7a). The cumulative average number of peri-islet leucocytes in diabetic cases was also higher than in intra-islet regions in insulin-positive islets (Fig. 7b). In addition, the average number of peri- and intra-islet leucocytes in insulin-positive islets was higher than in insulin-negative islets (Fig. 7b). In the non-diabetic groups, the cumulative average number of peri- and intra-islet leucocytes was lower than in the diabetic group (Fig. 7b). The difference in the mean peri- and intra-islet CD45 cells for non-diabetic autoantibody-negative cases compared with diabetic cases with insulin-positive islets was −8.49 (95% CI −0.67, −16.30; p = 0.037) and −3.38 (95% CI −0.60, −6.17; p = 0.021), respectively. A summary of the number of islets studied from all cases and the mean and median number of peri-islet and intra-islet leucocytes in insulin-positive and -negative islets is shown in Table 3. In the diabetic group, 68% of the insulin-positive islets were insulitis-negative. Although insulitis has been long-recognised as a major islet inflammatory cell hallmark of type 1 diabetes, factors that promote its onset, expansion and resolution remain obscure. Our systematic quantitative analyses of islets from a cohort of diabetic patients showed that peri-islet leucocytes are more numerous than intra-islet leucocytes. Although intra-islet CD8 T cells have been strongly implicated to be pathogenic to beta cells, the role of peri-islet leucocytes in this process is less clear [6, 30]. A recent immunohistochemical study in human and NOD mouse pancreas reported that T cells which extravasate from the post-capillary venules surrounding the islets can remain benign in the peri-islet space but acquire pathogenicity only upon islet invasion . This contrasts with a previous animal study which suggests that pathogenic T cells could extravasate from intra-islet fenestrating capillaries, guided by closely located dendritic cell protrusions, rather than upon degradation of the peri-islet barrier . How precisely such cellular events in an animal model mimic the human disease remain unresolved. The presence of some insulitis in three out of eight non-diabetic autoantibody-negative individuals was perplexing, and we speculate that this pathology may reflect a low degree of diabetes-unrelated immunological reactivity within the islets or that the donors may have been showing early signs of diabetes risk. Our additional observation of some level of insulitis in all five non-diabetic individuals with one or two autoantibodies is equally intriguing, as this feature may foreshadow clinical disease. Analyses of more cases from this unique group are necessary to address this issue. The highest frequency of insulitis in a patient with 10 years of diabetes and devoid of islet beta cells is noteworthy and suggests that during the disease a large number of leucocytes may remain in islets in the long term, even in the absence of beta cell antigenic stimulus. Alternatively, this extreme pathology may have been a reflection of pancreatitis of the donor. The low level of insulitis observed in a single autoantibody-negative diabetic patient raises the intriguing possibility that insulitis may not always be a pathological marker of type 1 diabetes. Further case studies are required to resolve this paradox. A predominantly peri-islet infiltrate in residual beta cell-positive islets implies that leucocytes in this zone may exert pathogenicity through the release of beta cell toxic molecules . Thus, in inflamed islets, IL-1β and TNF-α released by peri-islet macrophages and IFN-γ by T cells may lead to upregulation of inducible nitric oxide synthase, elevated nitric oxide and beta cell expression of MHC class I [23, 24]. Nitric oxide can also rapidly diffuse through the islet extracellular space and impair beta cell function, leading to beta cell death . Additionally, cytokines released by peri-islet leucocytes upon binding to their cognate receptors on beta cells may activate downstream signalling pathways, leading to beta cell demise. A recent report has shown that some markers of ER stress, such as binding immunoglobulin protein, are present in beta cells of mostly peri-insulitic human islets. . In the NOD mouse and in a rat model, markers of ER stress are already increased prior to diabetes onset, supporting an important pathogenic role of peri-islet leucocytes [27, 33]. We show that diabetic pancreases display considerable inter- and intra-individual variability in relation to the number of islets with residual beta cells. Although it remains inexplicable, we further confirm their clustering in specific pancreatic lobular sites. More importantly, the surviving insulin-positive cells reported in our study may be the source of micro-secreted endogenous insulin reported by others in many long-standing cases [21, 34]. In other studies, immunohistochemistry in a small subset of long-standing diabetic pancreases has confirmed the presence of some islet beta cells, a proportion of which are apoptotic [21, 22, 35]. Although the expression of glucose transporters in residual beta cells implies preservation of beta cell function, it remains unproven whether the transporters are downregulated in specific beta cells adjacent to leucocytic infiltrates, which has been shown in diabetic NOD mice [36, 37]. The presence in diabetic people of a proportionately larger number of islets harbouring insulin cells but without insulitis, shown here, is novel but its significance is unclear. The presence of leucocytic infiltrates in a small proportion of insulin-negative islets from diabetic individuals has not been highlighted previously and may be due to re-establishment of the extracellular matrix envelope in such islets and retarding leucocyte efflux . However, we cannot rule out that islet sections viewed by conventional two-dimensional microscopy showing an absence of beta cells may still harbour the same cells out of the plane of section. Although a detailed assessment of the degree of leucocytic infiltration of the exocrine regions was not our primary focus, we highlight its qualitative increase during diabetes and in non-diabetic individuals with autoantibodies. Exocrine leucocytes, while performing an immune sentinel role, may be pathogenic in type 1 diabetes . They may mediate acinar cell damage leading to reduced organ weight [39, 40]. Our observations are supported by a recent detailed study documenting an increased density of CD8 T cells in the exocrine regions of type 1 diabetic donors . Investigation of the pathogenic role of exocrine leucocytes in type 1 diabetes is warranted. Our present findings expose several under-appreciated features of insulitis and imply that peri-islet leucocytes may be pathogenic in type 1 diabetes. Our study, however, has some limitations. Although we carefully analysed pancreases from a limited number of diabetic patients, we must interpret our data with some caveats and recognise the limitations of case reports. Analyses from a larger cohort will be performed as more suitable cases become available from nPOD, particularly from non-diabetic autoantibody-positive individuals. These additional studies will permit improved statistical analyses and provide valuable clues to the true beginnings of beta cell damage. Second, despite the use of a reliable anti-insulin antibody to visualise beta cells immunohistochemically, degranulated beta cells devoid of insulin would have evaded detection. Use of additional markers indicative of insulin-negative beta cells would be beneficial. Nevertheless, the present cross-sectional study, despite being a snapshot of the cellular immunological events at the level of the islet in type 1 diabetic cases, provides valuable new insights into the heterogeneous immunopathology of islets. These include the prominence of peri-islet leucocytes in the insulitic lesion and its apparent absence in a majority of islets harbouring insulin-producing cells, and the additional presence of exocrine leucocytes and their role during type 1 diabetes. Further studies will be required to identify and confirm molecular effectors of postulated peri-islet leucocyte-mediated beta cell destruction. We are grateful to nPOD for supplying pancreatic sections for this study and to M. Campbell-Thompson (formerly of nPOD) and S. Richardson (Peninsula School of Medicine, Plymouth, UK) for advice regarding antibodies and protocols. From the University of Auckland (Auckland, New Zealand), we thank P. Browett and G. Krissansen for their ongoing encouragement, H. Woo and A. Al-Ani for their assistance in additional image acquisition and provision of figures, S. Amirapu for histological assistance, V. Hinder for preparing the box plots and analysing some of the data, and J. Ross for advice on image preparation. A brief report based on this study was recently presented at the 13th international Immunology of Diabetes Society meeting in Lorne, VIC, Australia, in 2013 and at the 6th nPOD workshop in Jacksonville, FL, USA, in 2014. We are grateful to the New Zealand Society for the Study of Diabetes, the Royal College of Pathologists of Australasia and the School of Medical Sciences, University of Auckland, for partial financial support towards this study. SR conceived and designed the experimental studies, carried out a considerable portion of them, acquired and analysed the data, wrote and revised the manuscript critically for publication, and led and directed the study. FW assisted in the conception and design of the study and in critically revising the manuscript. MJM assisted in the analysis and interpretation of the data and in critically revising the manuscript for its intellectual content. NZ, HA-D, DJ, CY and MOJ assisted in performing part of the experimental studies, image acquisition, and reading and revising the manuscript. All authors have given their final approval of the version to be published. SR is the guarantor of the work.